Early season duck hunting strategies are vitally important for successful hunts on small rivers. And while most hunters are either on high dollar hunting leases or battling the crowds at the local refuge, many of the small rivers tend to see very little hunting pressure. Early season is a great time to hunt ducks on the rivers in your area. Rivers offer waterfowl with many loafing areas with the many sloughs, inlets, bends, and sandbars that exist just off the main channels. Finding these areas early in the season usually means some fantastic duck hunting opportunities. Here are some tips for duck hunting small rivers early in the season and what makes them so effective. When early season duck hunting spreads won’t work, the answer is to plan a float trip. Duck hunting small rivers and streams is available in most states for anyone with a small boat and a public access point. You won’t see the variety of ducks that larger bodies of water seem to attract, but the hunting can be even more consistent. River duck hunting in most areas starts with wood ducks. These beautiful birds thrive along densely wooded streams, rivers, and sloughs. They feed on aquatic vegetation, but really love acorns that fall from mast producing trees that line small rivers and streams. Float hunting ducks along stretches where acorns may be falling into the water is the perfect setup for early season wood duck hunting. Float hunting allows you to cover a ton of ground when it’s difficult to find birds. Wood ducks like to find cover after the first hour of light and once they find seclusion can stay put most of the day. With little hunting pressure and mild temps during early season, you’re left with little choice but to go find them. Floating is best done by canoe, kayak, or john boat. Each of these methods is a quiet way to sneak up to a flock of birds loafing on the bank during a sunny October afternoon. The most important aspect of float hunting small rivers is to be prepared for anything. Stealth and the ability to shoot well are the two biggest keys to duck hunting small rivers. Early season ducks might allow you to float right up to them on the first encounter, but they wise up quick and may require better tactics later in the season. Staying as close to the bank as possible and letting the current take you to the birds is what works the most. Wood ducks tend to hang out on the shoreline, on logs, or back in brush and inlets. Mallards tend to hang out in the slower open sections of small rivers. Complete concealment in your boat while approaching resting ducks is key. Larger groups of ducks are hard to sneak up on and won’t let a strange object approach them no matter how stealthy you are. Point your boat downstream, let the current take you, and keep a low profile for the best float hunting results. Duck hunting river sloughs during the early season can lead to some impressive results. If you don’t have a boat, don’t worry. Jump shooting is a great early season tactic to implement that involves sneaking along the banks of small rivers and streams to get close enough for a shot. A trusty pair of binoculars, hip waders, and your shotgun are all you really need to master jump shooting small rivers. Patience is also key as taking your time to methodically sneak up and use cover to get as close as possible to resting ducks is the name of the game. Wood ducks are especially prone to jump shooting tactics as they like to keep tight to log jams and tangled deadfalls that pile up along the shore. Small open water pockets behind debris are great areas to survey and glass for early season wood duck hunting. As with most methods, jump shooting takes a lot of practice, skill, and patience to pull off correctly. Most shots won’t be slam dunks, but rather fleeting chances at 20-30 yards in thick cover. Studying the water ahead of you for hundreds of yards is the best approach so you can plan the best route of attack. Once you’ve spot birds ahead of you, make a note of where they are and develop a plan of approach using any cover available. Putting as much cover between you and them until you plan to take the shot always seems to work the best. Even if you have to climb out of the river bank and come in from another direction, take the time to do it right. Another tactic that works well for hunting river ducks is to flush them to a hunter that is waiting upstream. Wood ducks especially will make short flights upstream which barely break the height of the ordinary high water mark. Pushing the birds to a friend setup 300-400 yards away can lead to some fast and furious shooting. Pro Tip: For low light conditions right at shooting time or late evening, use a hi-viz shotgun sight to help get on target quickly. The Cabelas Ultimate II Waders are perfect for small river jump shooting. When the early season ducks get wise to float hunting, small spreads can work really well on rivers and creeks. With proper scouting to find areas that ducks like, decoys are often the perfect tool to draw birds within range. 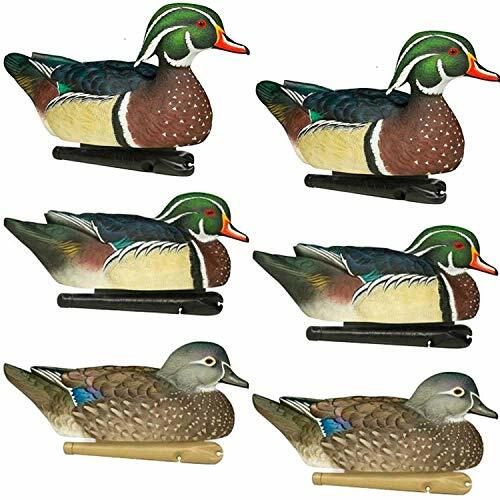 River duck hunting decoy spreads tend to vary in size depending on the amount of open water available and rate of the current. While large rivers can accommodate huge spreads numbering 10 dozen or more, small river hunting is usually limited to a dozen or less decoys. Most small river duck hunting is centered on finding hidden channels, sloughs, and oxbows that the birds are using to either rest or feed. Doing your homework is the best way to stay on the birds as they move around to different areas. Duck hunting sandbars is a good tactic to use if the river you hunt has a lot of exposed flats completely surrounded by water. Mallards especially love resting on exposed sand bars in small rivers. Placing a dozen mallard full body decoys and a few floaters near them is all that you need to simulate loafing birds. Small river ducks usually travel around in small groups, trios, or pairs during the early season. Wood ducks almost exclusively are found in pairs or singles. A good strategy to use for wood ducks is to place 6-8 decoys out with a pair of mallards. This way when you make a hen mallard hail call at passing birds, they are likely to make the connection that a mallard is in fact there. Camouflaging your blind really well by using natural vegetation and woody debris will help you blend in the best on most river banks. Modify your small river duck spread for the numbers of birds you’re seeing as well as the different species. Using fewer decoys and concentrating on realism is what matters the most. Weather extremes seem to be the norm these days and that means unpredictable water situations. Most river duck hunting is made better by floods which create overbank flow that expand outward into nearby shallow areas. However, hunting can be even more consistent on drought years when water is scarce. Small rivers will still sustain a flow even during the most extreme droughts. When prairie flats and potholes dependent on direct precipitation are drying up, small rivers are the best place to still find water and ducks. Dabbling ducks love shallow water and a river that is experiencing drought conditions makes aquatic vegetation and sub-bottom habitat more accessible. Grass flats that are normally in 4-5 feet of water could be in as little as 1 foot. Patterning your shotgun for close shots within 30 yards is ideal for hunting river ducks that like to hold tight and not fly far. Drought causes ducks to congregate in larger groups on the last remaining water sources. The slower current and abundant exposed sandbars of small rivers can be some of the most consistent hunting during a drought. Early season duck hunting on small rivers is a great strategy with many options and the potential for unpressured birds. Small duck spreads work best for early season when wood ducks are the most abundant duck around. Float hunting is a time tested method that can allow you to cover lots of ground and get close to loafing birds. Wood ducks like to hold tight to brushy areas, log jams, and river shorelines. Mallards prefer open water eddies and sandbars. Letting the current direct you toward the birds while staying hidden in a kayak, john boat, or canoe is often the most productive tactic. Jump shooting is another early season tactic for river ducks that doesn’t require a boat. This spot and stalk method is simple to implement, but requires skill and patience to pull off correctly. Using brush and tree’s to sneak up on birds or flushing them in the direction of another hunter set up further upstream can work if the conditions are right. Small decoy spreads can also be productive for early season river ducks looking for a place to feed. Scouting and placing your spread in the areas the birds are using should be your top priority. River ducks tend to fly in small flocks, pairs, and trios, so less decoys work the best, but realism is the key. If you’re in a drought, scout your local rivers and streams. Most of the prairie duck flats will probably be dry, but the river could be the only water around holding large concentrations of ducks. Low river levels expose aquatic vegetation and sandbars that offer refuge when water is scarce. Need a new waterfowl choke tube? Check out our top picks here!